Javea villas with pools, holiday home letting, holiday cottages to rent, house rentals, gites hire, property lets, self catering accommodation or even a luxury villa to let for family holidays in Javea. Choose from around 90 fabulous villas in Javea many with sea views and even some within walking distance of the beach. Renting a villa in Javea is many peoples idea of an ideal way to spend the summer holidays. It’s easy to see why. As a location for villas Javea is privileged, with its beautiful port, excellent beach, old town, dramatic scenery, lack of high rise development and fabulous climate. As a consequence Javea as a destination has dominated the villa rental market in the Costa Blanca for over 30 years. Javea is easy to get to as there are many direct international flights to nearby Alicante (ALC) airport 111km (takes around 1 hour 13 minutes and we can arrange airport transfers if required). Valencia (VLC) airport 123km takes around 1 hour 20 minutes by car. The climate is fantastic, mild all year round with little rain. 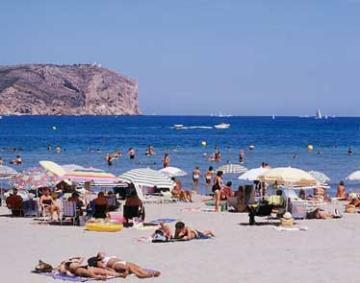 UNESCO said that the climate in Javea was ideal. We have 70 villas in Javea. 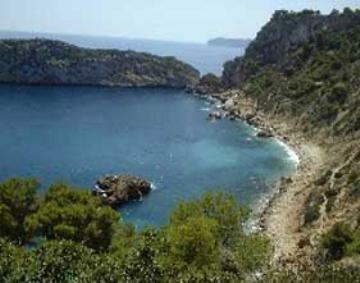 Javea is location on the plain of the Montgo mountain range which stretches inland from the coast. The old town of Javea is built around the fortified church of San Bartolomé which was designed to repel pirates. In the narrow roads of the old town visitors are drawn by the many examples of old, traditional architecture such as the old iron grills and stone window sills. In the town centre there is the museum of archeology and ethnology which focuses on the region and along by the port is the unusual modernistic church Nuestra Senora de Loreto designed in the form of a boat. There are many excellent Javea beaches, the main one is El Arenal, a wide sandy beach backed by excellent cafes and restaurants. El Portixol ii is perfect for diving and kayaking around the nearby rocks. La Grava is a stony beach near the port which has sun loungers for hire, nice clear sea and excellent restaurants and cafes nearby. La Granadella is a small beach by the Cap de la Nao, a lovely setting with turquoise water. 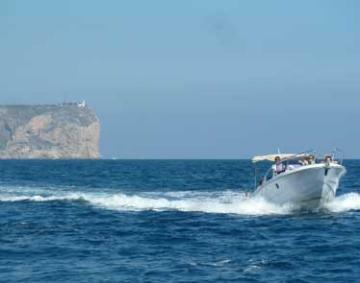 There are superb Costa Blanca boat trips around the coast and islands from Javea port. The Playa de Las Rocas is favoured for walks and fishing. La Caleta or Cala Blanca at Cap san Martin is a rocky area with fabulous views. I Montanar is a long straight beach with lots of parking space. Cala Cap Marti is best accessed by boat, here the sea is full of fish and its great for diving around the rocks and caves. El Portixol or La Barraca at Cabo San Martin lies in a bay surrounded by pine woods and is another excellent location for diving. Ambolo is the naturist beach. The Javea golf club is set back around 5km from the beach. Its an 18 hole par 72 course created by Francisco Moreno and is open all year round. The Montgo natural park is a very pretty spot and there are some delightful walks, so do take your boots if you are a keen walker as evenings and early mornings can be delightful. There are lots of flora and fauna to enjoy amidst the woodland and cliff tops. The local cuisine is delicious with something for everyone from classic English dishes through to Valencian regional specialities. There are lots of rice based dishes such as paella, fresh fish which is beautifully cooked and marvelous deserts often laced with local almonds. The local wine is pretty good too, mainly originating from Alicante. Here are the restaurants where our clients have enjoyed eating out in Javea. Villas Worldwide are specialists in luxury villa holidays in Javea, consult our local experts, resident in Javea who have over 20 years experience of renting Javea villas. They are on hand during your holiday too, to reserve a restaurant or a boat, advise on places to visit and translate if required.